Students cast their vote for their favorite morning snack on Tuesday morning. The winning snack was then served to each of the students. 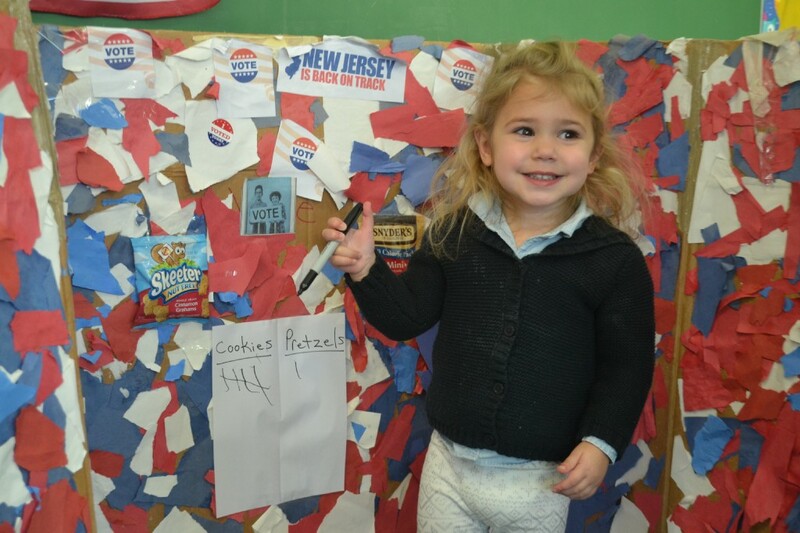 Reese Wheeler smiled as she cast her vote for cookies during her class election on Tuesday. Reese Wheeler slowly walked up to the voting booth on Election Day. She paused for a moment, examining the choices she had for what was may be her biggest decision of the day. 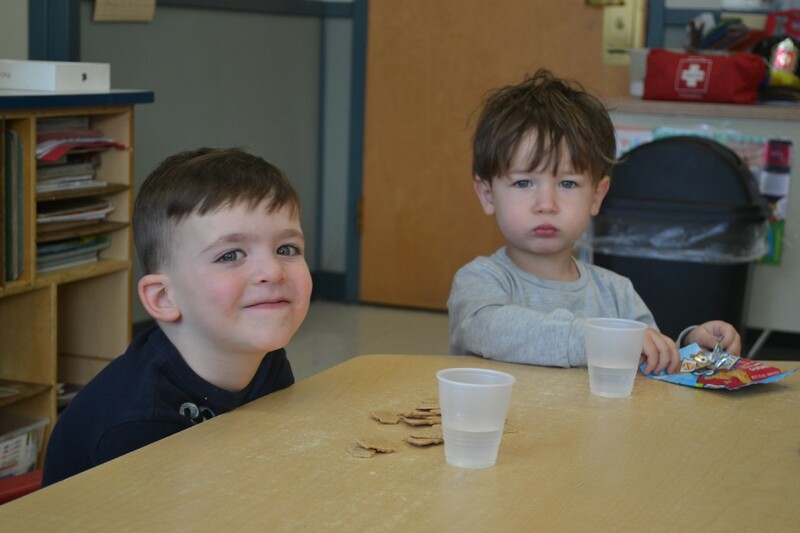 Would her class at the Katz JCC’s Sari Isdaner Early Childhood Center enjoy cookies or pretzels for morning snack time? Wheeler thought carefully, weighing her options before taking a black mark and putting a dash under the cookies column. When she was done, Wheeler smiled with excitement. Her civic duty for the day was complete. Adults weren’t the only people casting votes today. The classes at the Isdaner Early Childhood Center got a chance to vote themselves on cookies and crackers. 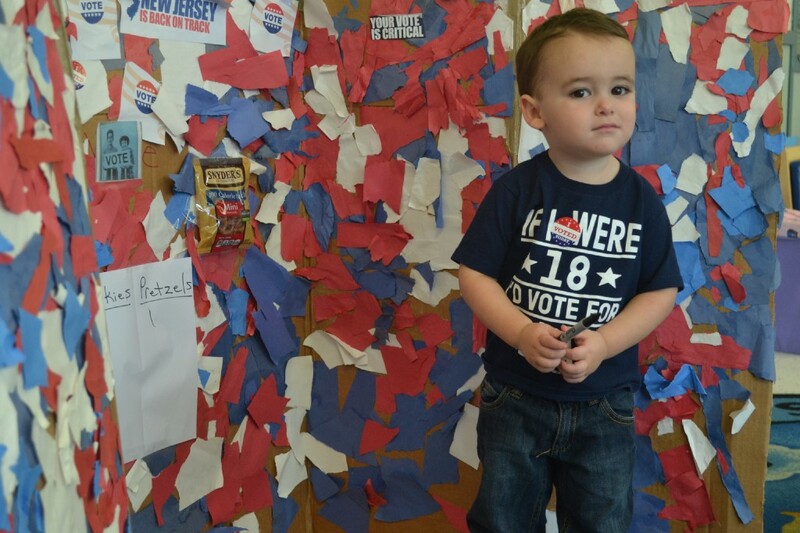 The 2-year-old students swarmed the voting booth in Janice Herskovits’ class around 10 a.m. on Election Day to make sure their voices were heard. Herskovits said the voting exercise allowed the students to begin learning about the importance of voting at an early age. She said the students’ parents are encouraged to bring their kids to the polls when they vote on Election Day. “We talked about Election Day and about choosing,” Herskovits said. In addition to the class election, the students learned about the White House, the presidents and how the election process works. 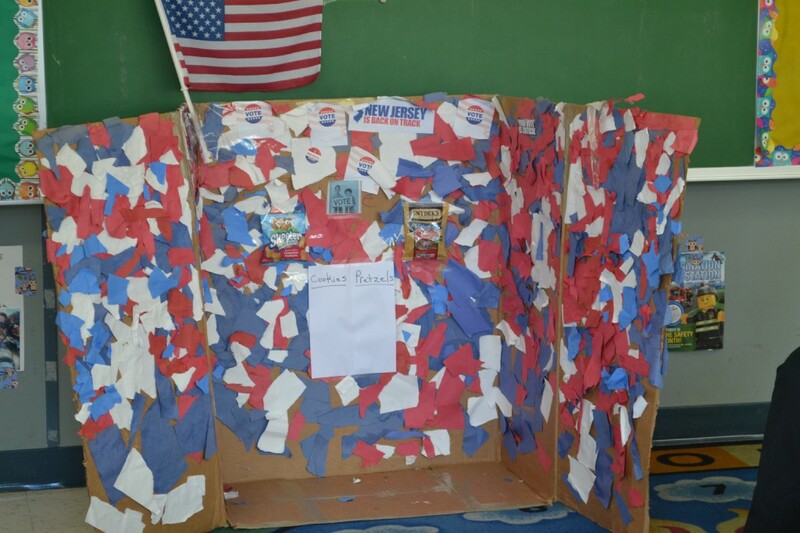 When it came time to vote, the students walked to a homemade voting booth complete with an American flag and patriotic decorations. A bag of cookies and bag of pretzels was taped to the top of the board to give the students a look at their choices. Benny Sideman cast his vote to have pretzels for snack time in his class on Tuesday. A few of the voters knew exactly what snack they wanted before they hit the polls. For Benny Sideman, the choice was easy. He put a long dash under the pretzel column on the class ballot. Other students had a tougher time making a decision. Sam Friedman went back and forth between cookies and pretzels before finally deciding to cast a vote for cookies. All 17 students present in Herskovits’ class cast a vote in their election. Once the votes were tallied, the results were announced. Cookies were the snack of choice for the class, with 12 students voting for cookies and only five choosing pretzels. For the students who were hoping to crunch on some pretzels for lunch, they would get their wish later in the day. There are no losing candidates in the Sari Isdaner Early Childhood Center. Pretzels would be the snack served to the students later in the afternoon. Michael Fiore and Charlie Au enjoy some cookies following their class’ snack election.